Your simple, 7 day, 5 minute long - get fit for skiing plan! Getting fit for winter. 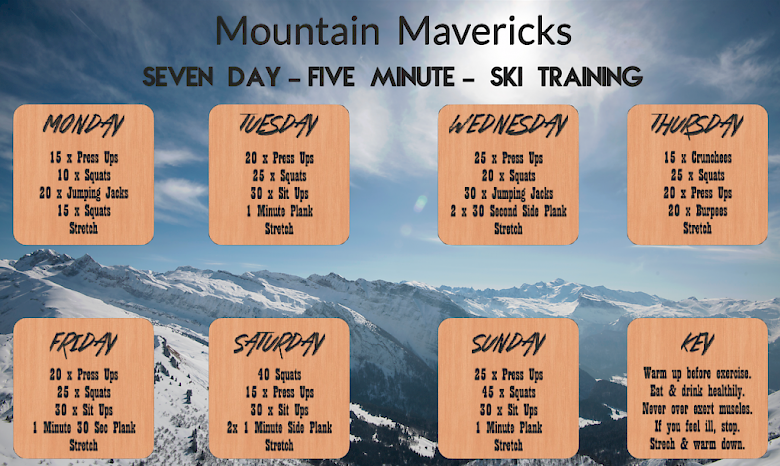 Mountain Mavericks ski training programme! 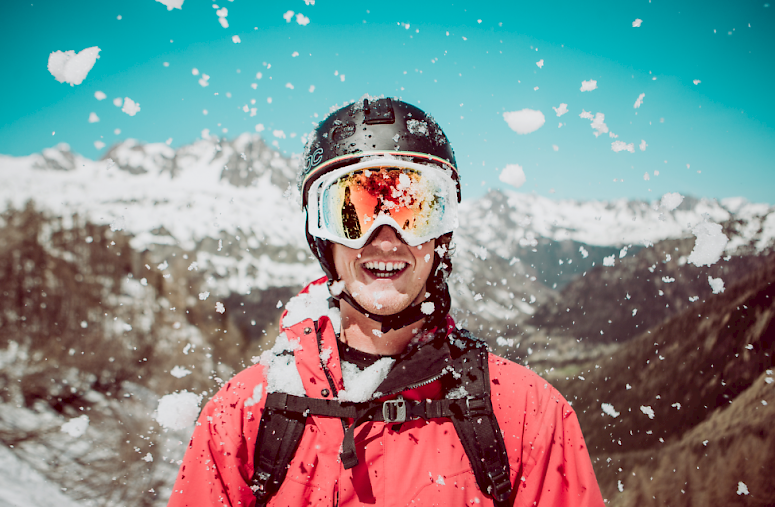 Most non-skiers probably think that getting fit for your holiday seems ludicrous. Yes, skiing is a sport. And yes skiing is a popular holiday activity. These non-skiers think holidays are for lying around in the sun, getting a sun tan and drinking cocktails whilst doing nothing in a deck chair! Well if you’re reading this – you’re more likely thinking, hell no! Have you not been on the top of the Swiss Wall at 9.30am with perfect panoramic views of the Alps? And have you not seen my post ski goggle tan and Instagram feed full of tasty cocktails? Ski holidays don’t need a marathon style training plan. But the (annoying) truth is that being prepared for your ski holiday with a light training regime will make your holiday 10x better. The more effort you put in the more you will get out of the mountains. Many muscles you use for skiing aren’t the types of muscle that get overly used in general everyday life. It’s not uncommon to hear a cheeky grown or moan on a Monday evening saying ‘my legs are stiff’, or ‘wow I’m getting old’. Realistically this is just because these said guests haven’t warmed those legs up and started the process of getting ready to use the muscles used for skiing pre-holiday. Well here at Mountain Mavericks we’re fed up of those pre-supper moans (only joking, we love a good grumble really), and we’ve prepared you a little weekly ski training programme for your ski holiday with us in Morzine! Even better – as we know everyone is busy, we’ve designed it to fit into around 5 minutes, and all you need is a small exercise space! Now with everything, the earlier you start the more prepared you’ll be. Make the most of small winter ski training programme and send us feedback on how you’re getting on, with any suggestions for any other ski training routines. When you’re in resort we’ll give you warm up & warm down stretch routines courtesy of Mountain Rehab, who will be able to help you with in-chalet massages and various ski related treatment so you can feel completely relaxed, no matter how hard you hit the slopes! Start this at least 1 month before your holiday. This is extra to keeping an active lifestyle and never push yourself further than you think you can go. The beauty of this is that all you need is a small area to complete each days exercise routine. So whether you are in the office, in the living room or simply have 5 minutes in a public place – get fit for the winter! So good luck with your new ski holiday training programme! The earlier you start getting into ski mode the more enjoyable your holiday in Morzine will be. We hope you find it useful and send us any feedback via our Facebook page! If you’re interested in booking a ski holiday this winter then get in touch with us via email get in touch with us via email and we’ll take care of everything so that you can focus on getting your legs into ski mode! Previous: Le Cottage taken on by Mountain Mavericks for the 2016/17 season!